Living in Denver, you hear your fair share of weed/munchies/Cheetos jokes. And while most are clownish depictions of our fair city, we all know that there is also a legit reality to those wisecracks. I called the Dirty Cookie a couple of weeks ago, when I came home jonesing for something sweet. After quickly disregarding the dusty box of Jello pudding in my cupboard, I remembered hearing about some mythical new company in town, that delivered fresh-baked cookies, ice-cream and milk. After some Googling, I found said company online and instantly started drooling over their menu. Essentially the way it works is that you order online (with a minimum order of $14, plus a $1 delivery fee), choosing from a wide assortment of baked-to-order cookies, milk, Little Man Ice-Cream, and Ziggy’s Fat-Free Frozen Yogurt. My particular order arrived in roughly 45 minutes after placing it online and the delivery guy was super friendly and did not make me feel weird at all for ordering a box of cookies for myself in the middle of the night. 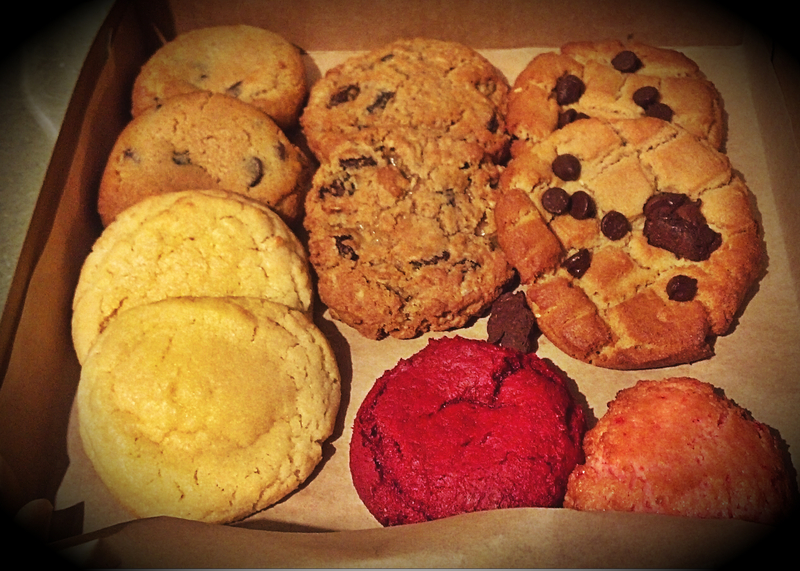 Additionally, I received a free red velvet cookie just cuz – haaaaaaaaay. My only critique? No non-dairy milk options. I asked about this and the guy said that there is not yet enough demand. Let’s make some demand people! Overall I was more than satisfied with this service, and look forward to getting super stoned and ordering from The Dirty Cookie again. The DC delivers Sunday through Wednesday until 12am, and Thursday, Friday, and Saturday until 2:30am. I almost got these from Iggy’s literally 2 days ago. Kind of sad I didn’t now!